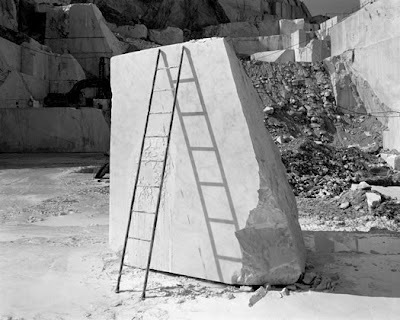 When I was in Virginia last week UVA photography professor William Wylie was in charge of looking out for me, and while I was waiting to talk to a group of students he showed me some of the equipment they use and a book of his photographs published last year, Carrara, which included some really lovely black and white photographs of the world-famous marble quarry at Carrara in Tuscany and a number of color portraits of the men who work there. When my wife and I were in Italy a few years ago her cousin from Lucca pointed out the quarries on a drive to the Cinque Terre, and he told us that the prized marble had been being extracted from the hills there since before the Roman times and that Michelangelo found the prized stone for his David there (I vaguely remembered some scene from a pre-adolescent reading of The Agony and the Ecstacy set in Carrara). Much of the late Roman forum was built of Carraran marble. And perhaps most importantly, at the beginning of the most recent James Bond movie, Bond drives his car through the quarries while avoiding the bad guys. 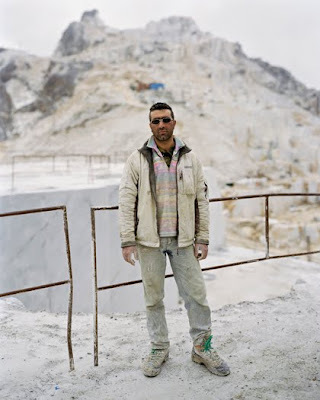 I recall William or someone else saying something about how the marble is nearly gone, and if so he has lovingly documented a dying industry. 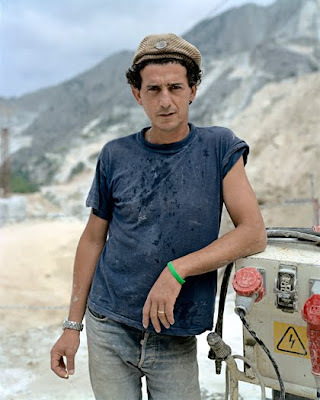 I really, really liked his portraits of the workers there. I have been working on a few portrait series myself behind the scenes here in Detroit and the work is much more challenging than the architectural stuff I usually do. 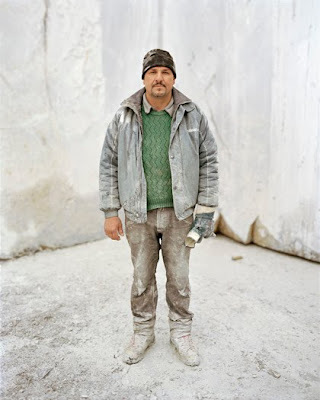 I love the straight on, full-body portraits of the men in their work clothes, all of them coated with a fine patina of white marble dust. That's how my dad always looked after a day in the shop. These men are Italian, so of course there is some worthy fashion going on here (check out that pink shirt and the jaunty hat on the last guy). They sort of remind me of the early Sartorialist portraits, except these are guys I can actually admire (instead of wishing I could push them into an open manhole cover). Wylie uses an 8x10 camera and the quality and craftsmanship really shows in the actual prints. The marble makes one hell of a backdrop. 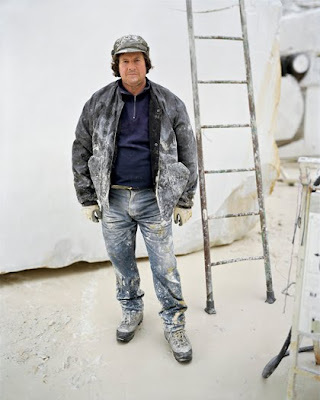 Spending weeks in the Tuscan countryside, eating, drinking, taking large-format photos of hunky Italian marble cutters in a historic location. . .how many times do you bet he's been asked how he got that gig?